شعار: Sulong na, Sulong pa Lungsod ng Dasmariñas! Fulgencio C. Dela Cuesta Jr.
1917 was the year when Perez Dasmariñas became a town again from Imus and the name "Perez" had been dropped. داسمارینیاس (به لاتین: Dasmariñas) یک شهر در فیلیپین است که در استان کاویته واقع شده‌است. داسمارینیاس وسیع‌ترین و پرجمعیت‌ترین این استان محسوب می‌شود. داسمارینیاس ۹۰٫۱۳ کیلومترمربع مساحت و ۵۷۵٬۸۱۷ نفر جمعیت دارد. ↑ "PSA Makati - ActiveStats - PSGC Interactive - Municipality: CITY OF DASMARI袮S". nscb.gov.ph. 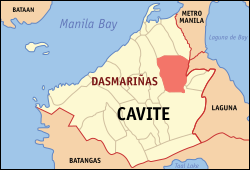 ↑ "Province: CAVITE". PSGC Interactive. Makati City, Philippines: National Statistical Coordination Board. Retrieved 29 October 2013. ↑ "Total Population by Province, City, Municipality and Barangay: as of May 1, 2010" (PDF). 2010 Census of Population and Housing. National Statistics Office. Retrieved 29 October 2013. ↑ مشارکت کنندگان ویکی‌پدیای انگلیسی. «Dasmariñas». این صفحه آخرین‌بار در ‏۱ مارس ۲۰۱۷ ساعت ‏۲۱:۳۴ ویرایش شده‌است.